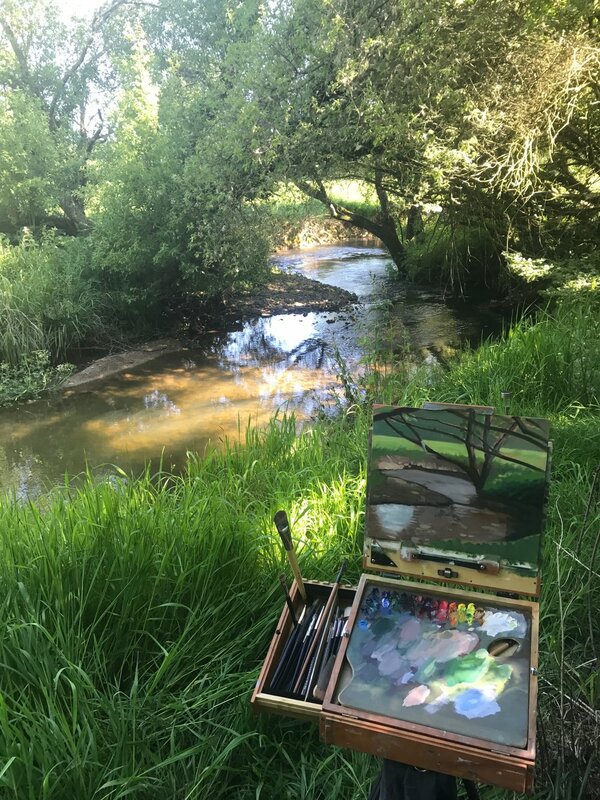 Taking up en plein air painting has been a challenge, but not for the reason you might think. It's not the painting that has been most challenging, but rather the conversion of my equipment from studio to outdoor kit. I began a while ago by buying a french easel (one of the most popular and recognisable en plein air easels on the market) but found it to be too clunky and ergonomically awkward. So I decided to design and build my own, but again, it still wasn't right. Still without a suitable solution, I turned to the web again to see if there was another design out there that would be more suited to my needs. I stumbled across a blog forum discussing artist's favorite easels and found several references and a great deal of praise for the 'Alla Prima Pochade Box' made and designed by Ben Haggett from Canada. I checked out his product video and recognised that here was a man who had spent a great deal of time contemplating and refining his own design. I have ordered his 10" x 12" Bitteroot Pochade Box which takes between 4-8 weeks for Ben to design, build and deliver. Click HERE for a video introduction and review. I will do another post with a review of the Bitteroot Pochade Box in several months time. NEWS: Winter in the Yurt is done. Spring in the woods has begun. Having spent nine very creative months in the yurt in Devon and a winter that allowed me to tuck myself away in blissful creative solitude, the next part of my adventure has begun. Having to work quickly to capture the light. Dealing with whatever the weather throws at me. Wild camping and working in the landscape. Having just completed my first outdoor session (pictured right), it's clear that it's a process that needs to be refined with time and experience. The couple of hours working this afternoon highlighted the kit that was unnecessary and the kit that should almost certainly be brought along next time! It's going to be an experience for sure, but in the long run my work should begin to loosen up, reflect more confident mark making and all in all imbue a more direct connection to my subject matter.